Up until I received my first polyleader, I had only used a floating fly line. I knew sinking lines and sink tip lines existed, but they were expensive, and I thought they really only fit in to a certain niche of fly fishing. I was more pragmatic then, and really could not justify spending 80 bucks on a line, then maybe another 60 bucks on a spare spool so I could swap a floating line for a sink tip line when I felt I needed a bit more depth in my swing. Enter the humble polyleader, an $8.99, 5ft, fast sinking answer to a problem I was not even aware that I had. 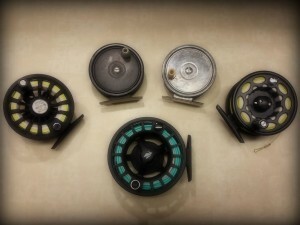 I attached the polyleader to my fly line using its welded loop, attached 5ft of level 2x tippet to the polyleader, and then attached a shad dart weighted with 5/32 dumbbell eyes to the tippet, and set out on one of the most successful days of fly fishing for shad that I had ever had up to that point. On my home water, the upper St. Johns River, depths average between 5-10 feet where I generally fish, so I typically opt for a 5ft polyleader attached to a 5 weight fly line. I typically choose either a Super Fast Sink rate or Extra Super Fast Sink rate and have had great success, especially when paired with 5/32 hourglass eye type flies. If I am fishing downstream towards Lemon Bluff where the water is wider and deeper, I may opt for a 10ft section with the same sink rates. The key to any sink tip system is to understand how fast the sinking tip sinks, and how deep the water is that you are fishing. Once you have that information, you simply swing the fly as you normally would by quartering upstream, and then count down the fly before starting your retrieve. If I am fishing with an Extra Super Fast sinking polyleader in 6ft of water, I know that I need to count the fly down for about 12 seconds before starting my retrieve to ensure the fly and polyleader are on the bottom. As you might imagine, adjusting where in the swing you start your cast, mends, and when you start your retrieve allows you to cover a larger range of depths and water than you could with just a floating line. Some of you may ask, “I am using a heavy sinking fly, why do I need a sink tip as well?” The answer is simple, using a sink tip keeps the fly deeper longer, and the shad are generally hanging near the bottom of the river. If you are only using a weighted fly on a floating fly line, when the fly reaches the end of its swing, the floating line pulls the fly through the water column more aggressively than a sinking or sink tip line. This means you are lifting the fly out of the shad’s face right at the critical moment they tend to strike, near the end of the swing or the beginning of the retrieve. Adding even a 5ft section of polyleader allows the fly to stay deeper longer, changes the angle of the fly to fly line connection so the fly rises through the water column more slowly, which gives the fly more time to entice a strike from a shad. I would encourage even a skeptic to try out a polyleader. For $8.99, you can change how you fly fish for shad, giving you access to water that your fly has probably not spent much time in if you are just using a floating fly line. This is the second of six articles included in the series entitled Fly Fishing for Shad- The Basics. So what type of fly rod do you NEED when fly fishing for shad? Because of their size, stamina, and ability to make multiple runs in to your backing, shad are formidable opponents. However, high-end, large weight rods are not necessary to land the feisty shad. 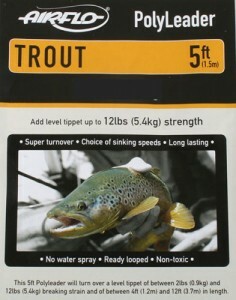 In my opinion, the best fly rod to use to fly fish for shad is the humble 5 weight rod in a 9ft length. I tend to gravitate towards medium fast action rods versus their fast action counterparts, but that is me. While a fast action rod might produce a tighter loop, I am more than capable or producing a tight enough loop to cast 60 feet with ease using a medium fast, and it does not bother my elbow like a fast action rod does. To me, the 5 weight rod is a perfect balance of power and finesse for fly fishing for shad. It lets you “feel” the fish during the fight, but still allows you to cast relatively heavy flies in a decent headwind. The ability to cast heavy streamers is key to shad fishing, as more often than not, you will be using flies either weighted with bead chain or lead eyes. And of course, more often than not, mother nature will send at least a breeze to complicate things. Now a 5 weight really is my favorite fly rod for shad fishing, but there are times when it just does not fit the conditions. Winters in Florida can produce days where wind speeds average 10-15 mph (or more) and that will send a fisherman without a larger weight rod packing. On these days I like to use a 7 or 8 weight rod. While you lose some of the “feel” of the fish with a larger rods ability to horse the fish to the net, you can punch through a stiff headwind and keep on fishing. So while it may not be as challenging to fight the fish, it is a lot more fun than heading home. Another recent option (to me) when the wind speed picks up (or even if it does not) is a two handed rod. Switch rods have recently become all of the rage in other genres of fly fishing, and during the 2014/2015 season, a 10 foot 8 inch 6 weight switch rod became my rod choice when the wind picked up. Heck, as I got better at Spey/ Skagit casting, the switch rod became my primary tool and opened up a whole new world to me. Switch rods with heavy Skagit heads allow a caster to reach new water with longer casts and get deeper using heavy sink tips. Two handed rods offer fly fisherman so many options that they warrant their own focus, and I will go in to more details in a future article. When fly fishing for shad, you really do not need a specialized outfit. You probably already have a fly rod in your quiver that can do the job. While a 5 weight rod is my favorite for light wind days and a 7 weight for high wind days, there is no reason a 6 or an 8 won’t work. However, in the interest of protecting the fish that you catch and release, I would not venture in to lower weights than the 5 weight as the extended fight time to bring the fish to hand will most likely produce more stress on the fish. Now I admit, I have caught shad on a 3 weight fly rod and boy, that is good fun! However in hindsight, it is not fair to a fish that I intend to release to pay the price of energy loss for my extended entertainment. These fish are here to spawn and create the next generation of fish we hope to catch after all. Likewise, going larger than an 8 weight, while maybe allowing you to fish in higher wind, will most likely result in little challenge and less fun.